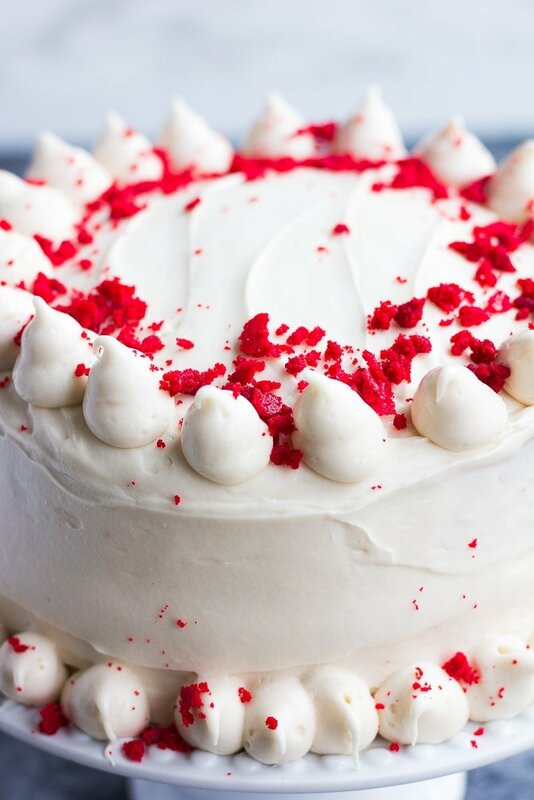 The most amazing Vegan Red Velvet Cake! 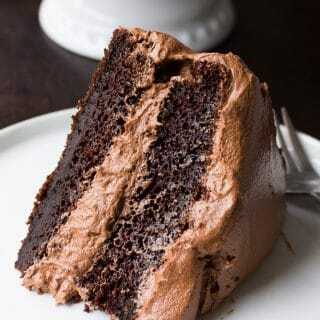 Moist, fluffy layers of red cake with a hint of chocolate. 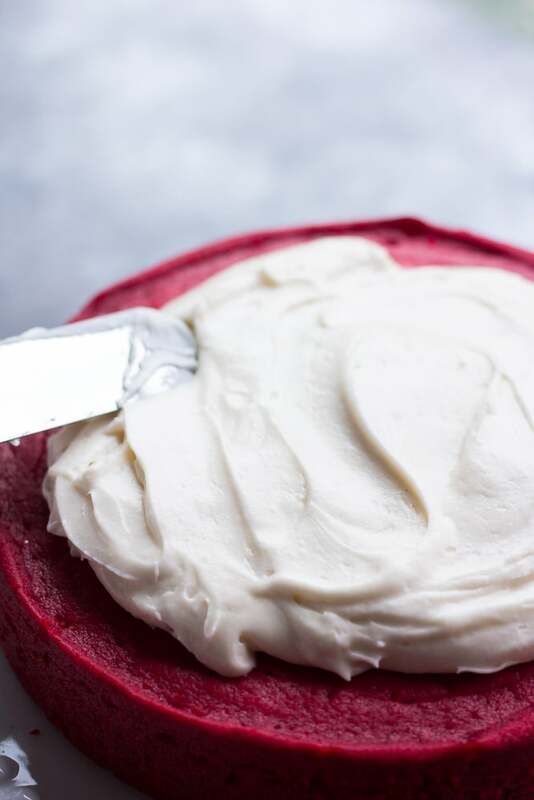 Sweet, tangy vegan cream cheese frosting. Simply incredible! 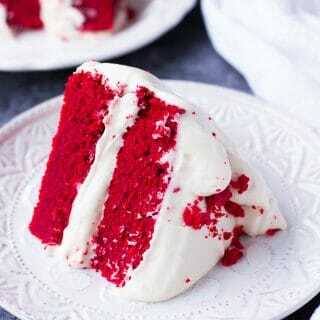 Red Velvet Cake is not just a chocolate or vanilla cake with a red hue. It has a hint of chocolate flavor that is very mild, and is typically made with buttermilk and a little bit of vinegar as well for the perfect blend of acidity and sweetness. It has a flavor like no other cake, and it is absolutely divine! For a vegan version of this amazing cake, we will make our own “buttermilk” with non-dairy milk and apple cider vinegar. 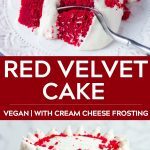 How do you make vegan red velvet cake? Next, whisk the dry ingredients in a bowl. Set aside. Using a hand or stand mixer and a large bowl, beat the vegan butter and sugar until creamy. Now add the other wet ingredients, except the “buttermilk” and mix. Add the red dye and mix it in as well. With the mixer on low, add in the dry ingredients alternating with the “buttermilk” until just combined, in about three additions. 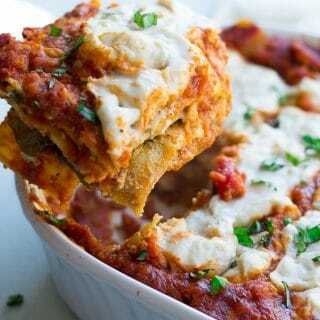 Pour into pans and bake for 35-40 minutes. While the cakes are baking, make a double batch of Vegan Cream Cheese Frosting. 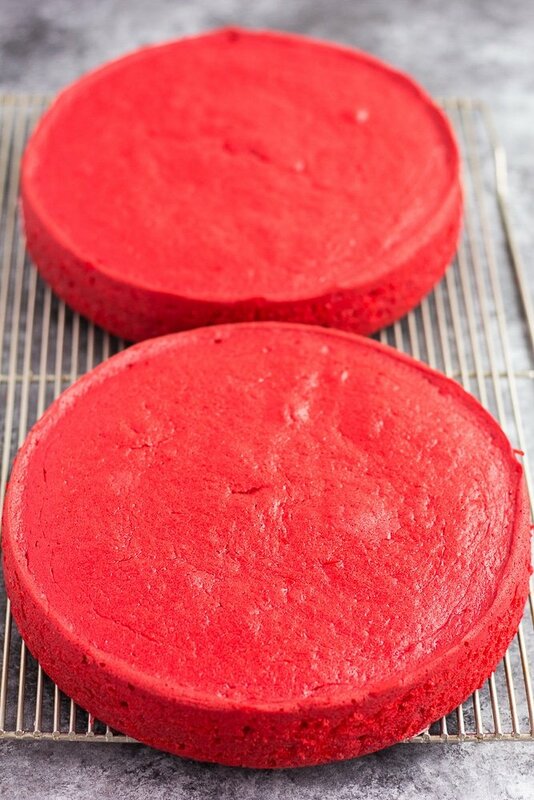 Is red food coloring vegan? 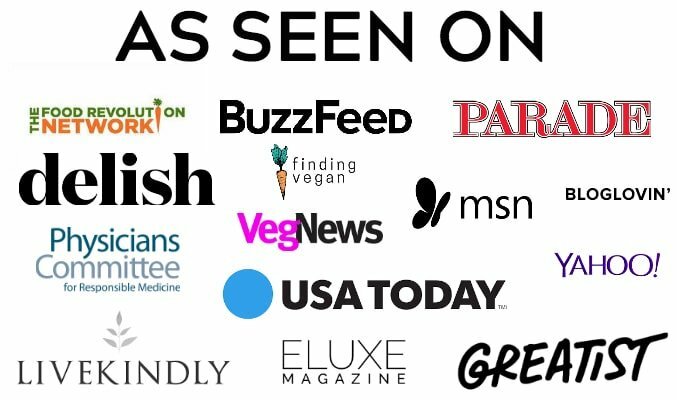 A lot of red food coloring is NOT vegan. This one is, so if you can find that you should be safe. 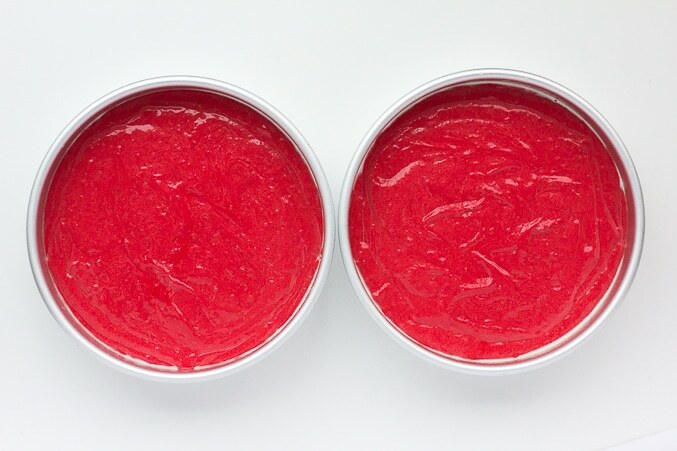 But if you want a more natural red food coloring, try this beet powder. It won’t be as bright as my cakes are, but it should work quite well! You could add more, or less depending on how colorful you want the cakes to be. I used a full 3 tablespoons. 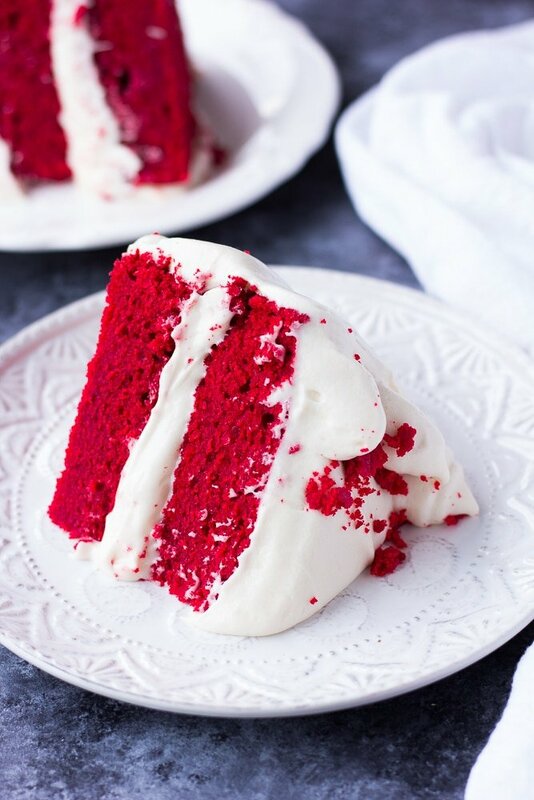 What kind of frosting is used for vegan red velvet cake? 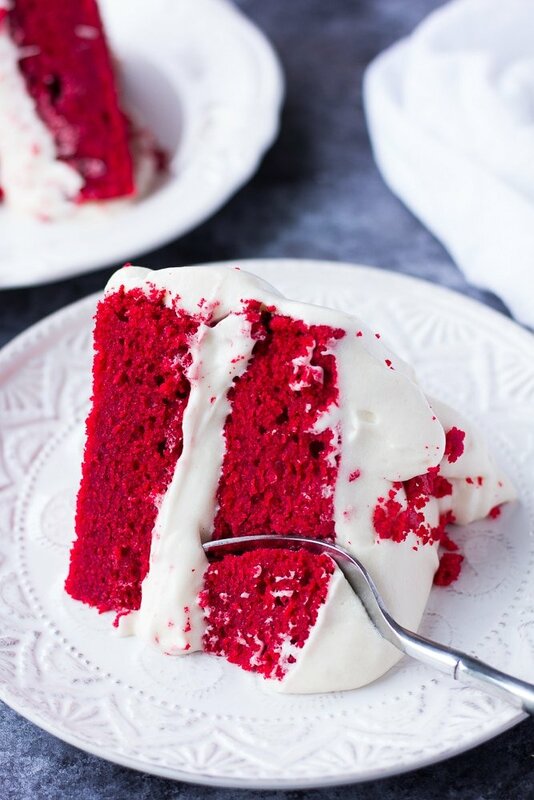 I can not eat Red Velvet Cake with anything other than Vegan Cream Cheese Frosting! If you aren’t a big fan though, or you can’t find vegan cream cheese, you can certainly use my classic Vegan Vanilla Frosting. It is easier to work with, but the cream cheese frosting is SO worth it. 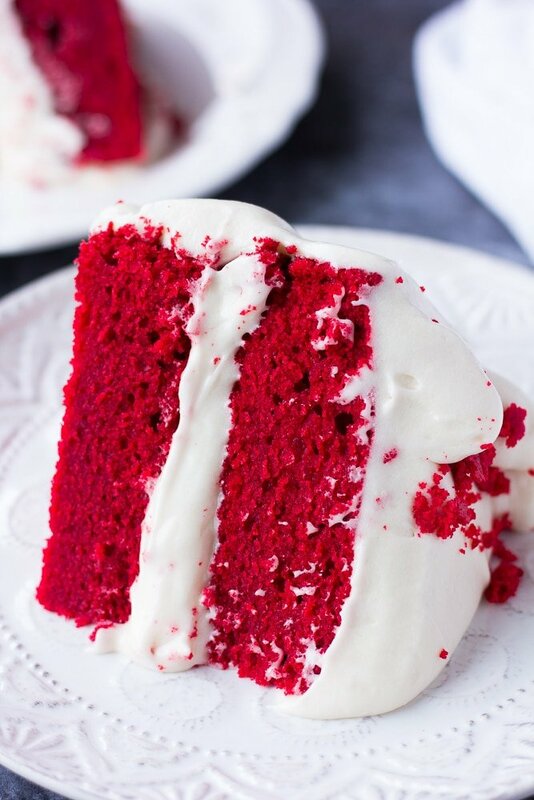 Plus, it’s traditional on red velvet cake for that unique acidic/sweet taste. If you are using cream cheese frosting, be aware that it tends to be less stable at room temperature than most other vegan frostings. This is because vegan cream cheese usually contains coconut oil which melts when it gets warm, and thickens when it’s cold. This means it is especially important that the cakes are COMPLETELY cooled before you frost, your frosting is thick and cold, and that you keep this cake in the fridge until serving. Don’t let it sit at room temperature, or you will have a melty, slippery cake on your hands! I even like to frost the first layer, then stick it in the fridge for 10 minutes before adding the second layer and finishing. Just to make sure that second layer won’t slip off! 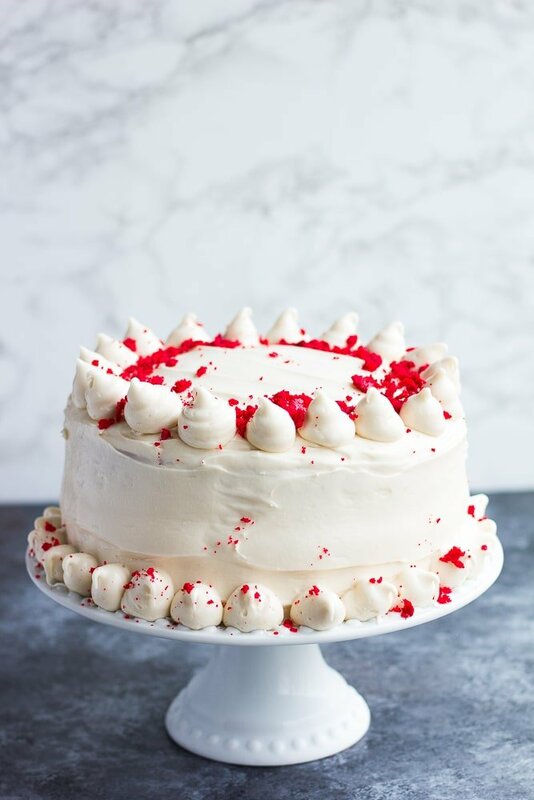 If you aren’t making a layer cake, but cupcakes or a 9 x13 inch cake, this is less important, but I would still keep anything frosted with vegan cream cheese frosting in the fridge. 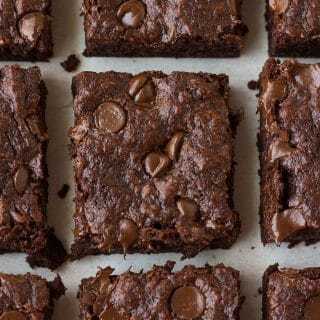 Check out these other incredible vegan cake recipes! Preheat the oven to 350 degrees F and spray (2) 8-inch cake pans with oil. I also put a small parchment paper circle in the bottom, to prevent sticking. Set aside. Make the Vegan Buttermilk: Pour the soy milk into a measuring cup and stir in the apple cider vinegar. Set aside to curdle; this is your "buttermilk." Add all the dry ingredients to a medium sized bowl and whisk to combine. If your cocoa powder is very clumpy, sift it into the bowl. With the mixer on low speed, add the dry ingredients alternating with the "buttermilk", in about three additions, until just incorporated. Divide the batter equally into prepared pans. Bake for 35-40 minutes, until a toothpick inserted in the middle comes out clean. Let cool on wire racks for 5-10 minutes, then run a knife around the edges to loosen, and carefully invert the cakes onto your hand. Remove the parchment paper and place on a wire rack to cool completely before frosting. Once the cakes are completely cooled, evenly cover the first layer with cream cheese frosting. At this point I like to stick the first layer in the fridge for 10 minutes, to ensure the frosting firms up and won't cause the second layer to slip. Then place the second layer on top, and frost the cake as desired. Keep this cake refrigerated until ready to serve, and any leftover cake in the fridge as well, as the frosting softens at room temperature. Alternatively, you could use Vegan Vanilla Frosting instead, if desired. Calories listed are per 1/16th of the cake, with frosting. Amounts are approximate. Feel free to substitute another non-dairy milk for soy, such as almond, cashew, oat, coconut or hemp milk. For cupcakes, fill liners half full and bake for 20-25 minutes. The whole recipe will yield approximately 24 cupcakes.